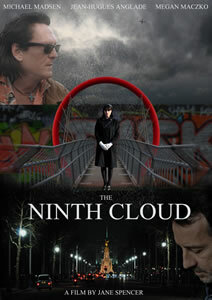 THE NINTH CLOUD, Jane Spencer’s dark, philosophical drama, starring Michael Madsen, Jean-Hugues Anglade, Megan Maczko and Leo Gregory, is now available to download in the UK exclusively on iTunes. To celebrate the release there is a special screening at the Prince Charles Cinema, on Mon 12 February, with cast and crew present, hosted by Eye For Film’s Anton Bitel. Director Jane Spencer said: “I am absolutely thrilled that THE NINTH CLOUD is finally being released in its home. We shot the film in London and, although it has an international cast it carries a very British sensibility, inspired by some of the UK’s great independent films”. THE NINTH CLOUD is a Jane Spencer film, written by Jane Spencer & Lucy Shuttleworth. It is produced by Marc Holthuizen, Julia Verdin, Kim Robson, Gia Muresan, Richard Hudson, Elena Baranova, & Wendy Thomas. Exec. Producers: Michael Madsen, Bruno Rosato, Michael Los, Steven Adams, Co Producers: Ernie Fritz, Kat Moon, Jan Daube, Steve Daly, Ruedi Schick.